NASA's Dawn spacecraft has obtained its first image of the giant asteroid Vesta, which will help fine-tune navigation during its approach. Dawn is expected to achieve orbit around Vesta on July 16, when the asteroid is about 188 million kilometers (117 million miles) from Earth. With a bit of luck, you might be able to identify a simulated star background star field at the Dawn website combined with the JPL Solar System Simulator, or you can submit the picture to the Astrometry.net pool and they'll identify it for you (I haven't tried this yet). I was drawn to the challenge of identifying the background field on my own. Dawn's framing camera 5.5º field-of-view makes guessing this field seemingly impossible, but using the JPL Horizons Ephemeris tool to retrieve and analyze the rectangular coordinate position data (relative or absolute) for Vesta and Dawn made it possible, and surprisingly accurate. Some trignonometry applied to the data directly correlates to the ecliptical coordinate system. So the line-of-site "pointing vector" from Dawn to Vesta is the difference in the X,Y,Z coordinates of the two objects, and this vector points to Vesta's celestial coordinates as viewed from Dawn. I looked a Horizons' data over many days, but picked the stated date of May 3rd as the date of the photo. My result? I calculated Vesta's coordinates as viewed from Dawn to <1º position error from the pictured position. The prediction is so close that I don't think I made any mistakes, or I was lucky. The Horizons ephemeris tells the Dawn approach story and it all makes sense! NASA's Dawn mission to the doughnut-shaped asteroid belt between Mars and Jupiter, which launched in September 2007, is now approaching Vesta, a protoplanet that is currently some 143 million miles from Earth. Many surprises are likely awaiting the spacecraft. "We often refer to Vesta as the smallest terrestrial planet," said Christopher T. Russell, a UCLA professor of geophysics and space physics in the Department of Earth and Space Sciences, and the mission's principal investigator. 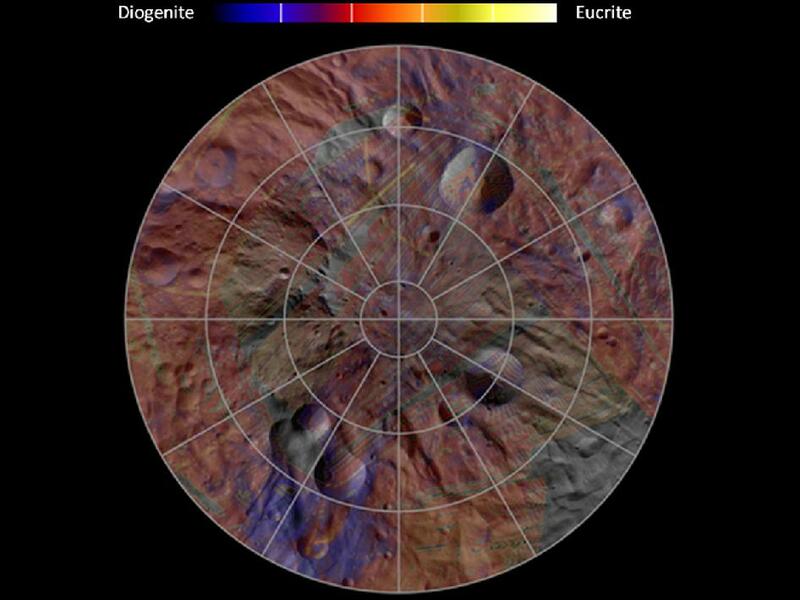 "It has planetary features and basically the same structure as Mercury, Venus, Earth and Mars. But because it is so small, it does not have enough gravity to retain an atmosphere, or at least not to retain an atmosphere for very long. "There are many mysteries about Vesta," Russell said. "One of them is why Vesta is so bright. The Earth reflects a lot of sunlight — about 40 percent — because it has clouds and snow on the surface, while the moon reflects only about 10 percent of the light from the sun back. Vesta is more like the Earth. Why? What on its surface is causing all that sunlight to be reflected? We'll find out." Dawn will map Vesta's surface, which Russell says may be similar to the moon's. He says he expects that the body's interior is layered, with a crust, a mantle and an iron core. He is eager to learn about this interior and how large the iron core is. Named for the ancient Roman goddess of the hearth, Vesta has been bombarded by meteorites for 4.5 billion years. "We expect to see a lot of craters," Russell said. "We know there is an enormous crater at the south pole that we can see with the Hubble Space Telescope. That crater, some 280 miles across, has released material into the asteroid belt. Small bits of Vesta are floating around and make their way all the way to the orbit of the Earth and fall in our atmosphere. About one in every 20 meteorites that falls on the surface of the Earth comes from Vesta. That has enabled us to learn a lot about Vesta before we even get there." Dawn will arrive at Vesta in July. Beginning in September, the spacecraft will orbit Vesta some 400 miles from its surface. It will then move closer, to about 125 miles from the surface, starting in November. By January of 2012, Russell expects high-resolution images and other data about surface composition. Dawn is arriving ahead of schedule and is expected to orbit Vesta for a year. "It's been a long trip," said Russell, who started planning the journey back in 1992. "Finally, the moment of truth is about to arrive." Vesta, which orbits the sun every 3.6 terrestrial years, has an oval, pumpkin-like shape and an average diameter of approximately 330 miles. Studies of meteorites found on Earth that are believed to have come from Vesta suggest that Vesta formed from galactic dust during the solar system's first 3 million to 10 million years. Dawn's cameras should be able to see individual lava flows and craters tens of feet across on Vesta's surface. "We will scurry around when the data come in, trying to make maps of the surface and learning its exact shape and size," Russell said. Dawn has a high-quality camera, along with a back-up; a visible and near-infrared spectrometer that will identify minerals on the surface; and a gamma ray and neutron spectrometer that will reveal the abundance of elements such as iron and hydrogen, possibly from water, in the soil. Dawn will also probe Vesta's gravity with radio signals. The study of Vesta, however, is only half of Dawn's mission. The spacecraft will also conduct a detailed study of the structure and composition of the "dwarf planet" Ceres. Vesta and Ceres are the most massive objects in the main asteroid belt between Mars and Jupiter. Dawn's goals include determining the shape, size, composition, internal structure, and the tectonic and thermal evolution of both objects, and the mission is expected to reveal the conditions under which each of them formed. Dawn, only the second scientific mission to be powered by an advanced NASA technology known as ion propulsion, is also the first NASA mission to orbit two major objects. "Twice the bang for the buck on this mission," said Russell, who added that without ion propulsion, Dawn would have cost three times as much. Unlike chemical rocket engines, ion engines accelerate their fuel nearly continuously, giving each ion a tremendous burst of speed. The fuel used by an ion engine is xenon, a gas that is also used in photo-flash units and which is more than four times heavier than air. Xenon ions shoot out the back of the engine at a speed of 90,000 miles per hour. UCLA graduate and postdoctoral students work with Russell on the mission. Now is an excellent opportunity for graduate students to join the project and help analyze the data, said Russell, who teaches planetary science to UCLA undergraduates and solar and space physics to undergraduates and graduate students. After orbiting Vesta, Dawn will leave for its three-year journey to Ceres, which could harbor substantial water or ice beneath its rock crust — and possibly life. On the way to Ceres, Dawn may visit another object. The spacecraft will rendezvous with Ceres and begin orbiting in 2015, conducting studies and observations for at least five months. Russell believes that Ceres and Vesta, formed almost 4.6 billion years ago, have preserved their early record, which was frozen into their ancient surfaces. "We're going back in time to the early solar system," he said. June 13, 2011 - PASADENA, Calif. -- <<Scientists working with NASA's Dawn spacecraft have created a new video showing the giant asteroid Vesta as the spacecraft approaches this unexplored world in the main asteroid belt. The video loops 20 images obtained for navigation purposes on June 1. The images show a dark feature near Vesta's equator moving from left to right across the field of view as Vesta rotates. Images also show Vesta's jagged, irregular shape, hinting at the enormous crater known to exist at Vesta's south pole. The Dawn mission is managed by NASA's Jet Propulsion Laboratory in Pasadena, Calif., for the agency's Science Mission Directorate in Washington. Dawn is a project of the directorate's Discovery Program, managed by NASA's Marshall Space Flight Center in Huntsville, Ala. UCLA is responsible for overall Dawn mission science. Orbital Sciences Corp. of Dulles, Va., designed and built the Dawn spacecraft. 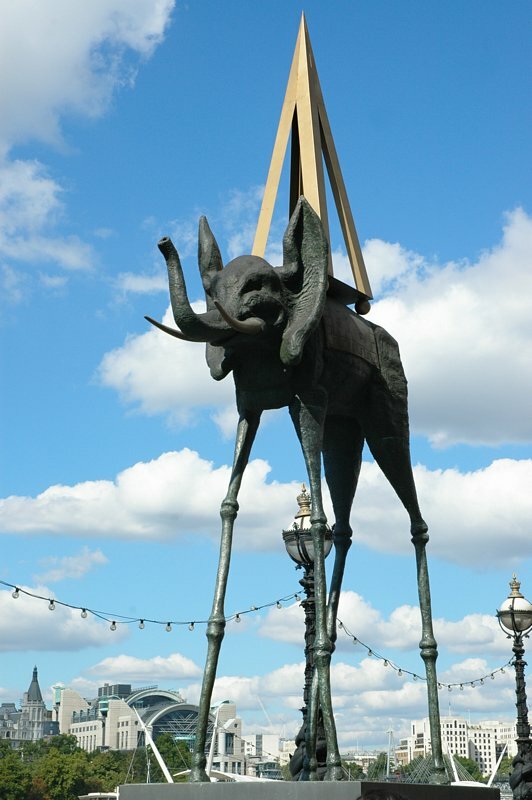 The framing cameras were developed and built under the leadership of the Max Planck Institute for Solar System Research in Katlenburg-Lindau, Germay. The German Aerospace Center (DLR) Institute of Planetary Research in Berlin made significant contributions in coordination with the Institute of Computer and Communication Network Engineering in Braunschweig. The framing camera project is funded by the Max Planck Society, DLR and NASA. JPL is a division of the California Institute of Technology in Pasadena. For more information about Dawn, visit: http://www.nasa.gov/dawn. You can follow the mission on Twitter at: http://twitter.com/NASA_Dawn. More information about JPL is online at: http://www.jpl.nasa.gov. 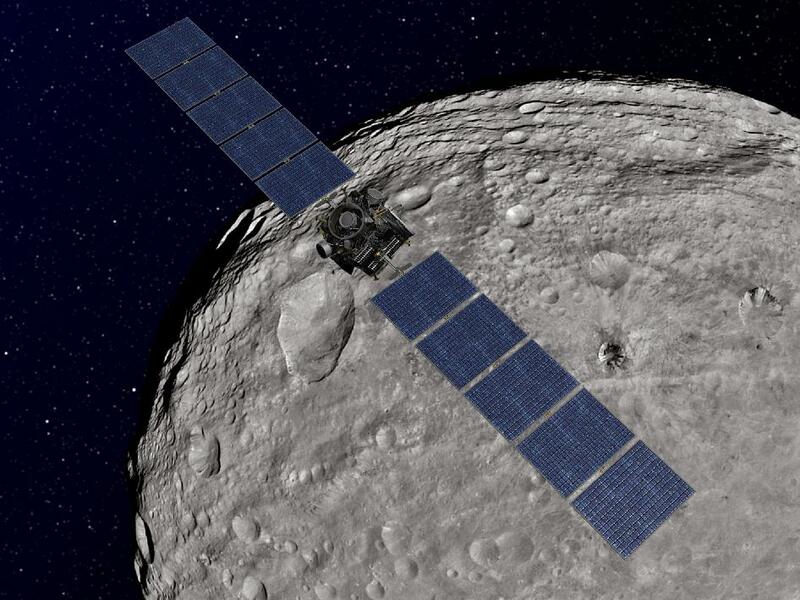 "The spacecraft is right on target," said Robert Mase, Dawn project manager at NASA’s Jet Propulsion Laboratory in Pasadena, Calif. "We look forward to exploring this unknown world during Dawn's one-year stay in Vesta's orbit." After traveling nearly four years and 1.7 billion miles (2.7 billion kilometers), Dawn is approximately 96,000 miles (155,000 kilometers) away from Vesta. When Vesta captures Dawn into its orbit on July 16, there will be approximately 9,900 miles (16,000 kilometers) between them. When orbit is achieved, they will be approximately 117 million miles (188 million kilometers) away from Earth. After Dawn enters Vesta's orbit, engineers will need a few days to determine the exact time of capture. Unlike other missions where a dramatic, nail-biting propulsive burn results in orbit insertion around a planet, Dawn has been using its placid ion propulsion system to subtly shape its path for years to match Vesta's orbit around the sun. Images from Dawn's framing camera, taken for navigation purposes, show the slow progress toward Vesta. They also show Vesta rotating about 65 degrees in the field of view. The images are about twice as sharp as the best images of Vesta from NASA's Hubble Space Telescope, but the surface details Dawn will obtain are still a mystery. "Navigation images from Dawn's framing camera have given us intriguing hints of Vesta, but we're looking forward to the heart of Vesta operations, when we begin officially collecting science data," said Christopher Russell, Dawn principal investigator, at UCLA. "We can't wait for Dawn to peel back the layers of time and reveal the early history of our solar system." Dawn's three instruments are all functioning and appear to be properly calibrated. The visible and infrared mapping spectrometer, for example, has started to obtain images of Vesta that are larger than a few pixels in size. During the initial reconnaissance orbit, at approximately 1,700 miles (2,700 kilometers), the spacecraft will get a broad overview of Vesta with color pictures and data in different wavelengths of reflected light. The spacecraft will move into a high-altitude mapping orbit, about 420 miles (680 kilometers) above the surface to systematically map the parts of Vesta's surface illuminated by the sun; collect stereo images to see topographic highs and lows; acquire higher-resolution data to map rock types at the surface; and learn more about Vesta's thermal properties. Dawn then will move even closer, to a low-altitude mapping orbit approximately 120 miles (200 kilometers) above the surface. The primary science goals of this orbit are to detect the byproducts of cosmic rays hitting the surface and help scientists determine the many kinds of atoms there, and probe the protoplanet's internal structure. As Dawn spirals away from Vesta, it will pause again at the high-altitude mapping orbit. Because the sun's angle on the surface will have progressed, scientists will be able to see previously hidden terrain while obtaining different views of surface features. "We've packed our year at Vesta chock-full of science observations to help us unravel the mysteries of Vesta," said Carol Raymond, Dawn's deputy principal investigator at JPL. Vesta is considered a protoplanet, or body that never quite became a full-fledged planet. Dawn launched in September 2007. 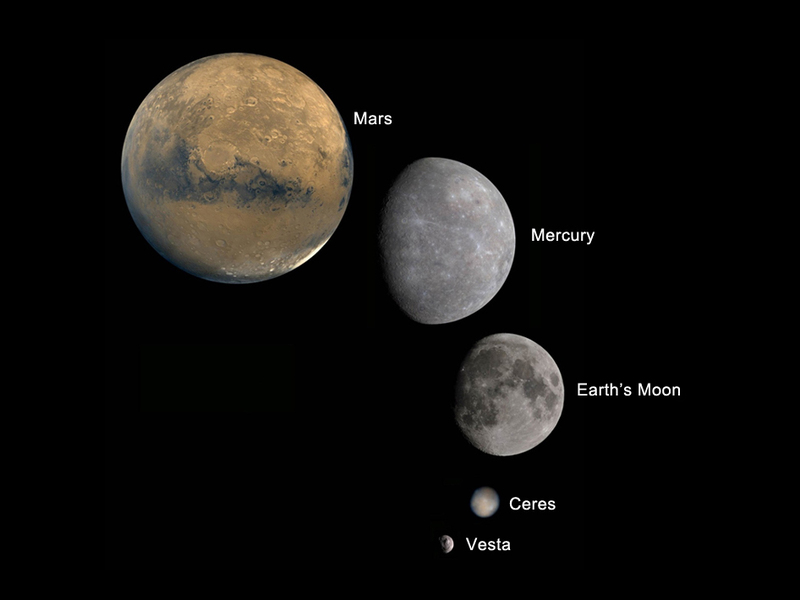 Following a year at Vesta, the spacecraft will depart for its second destination, the dwarf planet Ceres, in July 2012. Dawn's mission to Vesta and Ceres is managed by JPL for NASA's Science Mission Directorate in Washington. Dawn is a project of the directorate's Discovery Program, managed by NASA's Marshall Space Flight Center in Huntsville, Ala.
Pentagonal structure of Vesta. NASA's Dawn spacecraft obtained this image with its framing camera on July 1, 2011. It was taken from a distance of about 100,000 kilometers. NASA's Dawn spacecraft on Saturday became the first probe ever to enter orbit around an object in the main asteroid belt between Mars and Jupiter. <<A sharp-eyed reader noticed that a size comparison montage posted by the Dawn mission today included an image of Vesta that had not yet been released separately to the public, and it is a very cool one. It was taken at a different time of the Vestian day, with slightly more oblique lighting, and is very dramatic. Now that ridgy floor and central peak of the south polar impact basin look like a gigantic bug, or maybe a crab. There's a new orbital mission on the map! As of Friday, the relatively small mass of the asteroid Vesta (it only weighs half a ten thousandth of Earth's mass) has finally taken hold of its new artificial satellite, Dawn. But that's a tenuous grip, so for the next three weeks Dawn will continue applying its ion engines to tighten the orbit, spiraling inward from its orbit capture altitude of 16,000 kilometers until it has reached an altitude of 2,700 kilometers. Only then will Dawn officially be in Survey Orbit. This announcement came on Friday but I was hoping they'd release a new image from the new altitude, and today they finally did. Here it is, and it's a very pretty one, though there are some peculiarities I'll mention below. With this latest image Vesta has become, to me, a place -- no longer an imagined object, but a real one. The interior of that south polar basin sure looks weird. All around the central peak are chevron-shaped ridgy features that bring to mind Miranda -- which, by the way, is very similar in size to Vesta. Such an unusual terrain, located preferentially within the interior of this gigantic crater, must have something to do with how the crater formed, at least that's the way I see it. I'm looking forward to seeing what this terrain looks like at higher resolution as Dawn spirals downward. The Dawn spacecraft has completed a graceful spiral into the first of four planned science orbits during the spacecraft's yearlong visit to Vesta. The spacecraft started taking detailed observations on Aug. 11 at 9:13 a.m. PDT (12:13 a.m. EDT), which marks the official start of the first science-collecting orbit phase at Vesta, also known as the survey orbit. Survey orbit is the initial and highest orbit, at roughly 1700 miles (2700 kilometers) above the surface, which will provide an overview or "big picture" perspective of the giant asteroid. The primary objective of survey orbit is to image the surface with near-global coverage in visible and infrared wavelengths with the mapping spectrometer, also known as VIR. Dawn also will be using its framing camera to collect image mosaics that complement the VIR spectral data to produce geologic and compositional maps of Vesta's surface. Ultrasensitive measurements of the spacecraft's motion using radio signals will allow improved understanding of the giant asteroid's gravity field. Dawn's gamma ray and neutron detector will continue to collect background data. The survey phase is planned to last 20 days. Each orbit takes almost three days, which will provide the spacecraft seven trips around Vesta. After survey orbit, Dawn will resume thrusting, taking about a month to spiral down gently to its next science orbit for an even closer view. That orbit, known as High Altitude Mapping Orbit, or HAMO, begins in late September. Dawn will spend about a month in HAMO, circling around Vesta in half a day, rather than three. Dawn will orbit more than 60 times during HAMO, allowing the camera to fully map the illuminated portion of Vesta at even higher resolution, and enable the science team to generate stereo images. Astronomers keen to look into strange hole on second-largest asteroid. Vesta's large crater and equatorial ridges are mysterious. Planetary scientists thought they knew what to expect when NASA's Dawn spacecraft returned the first close-up portrait of the giant asteroid Vesta last month. 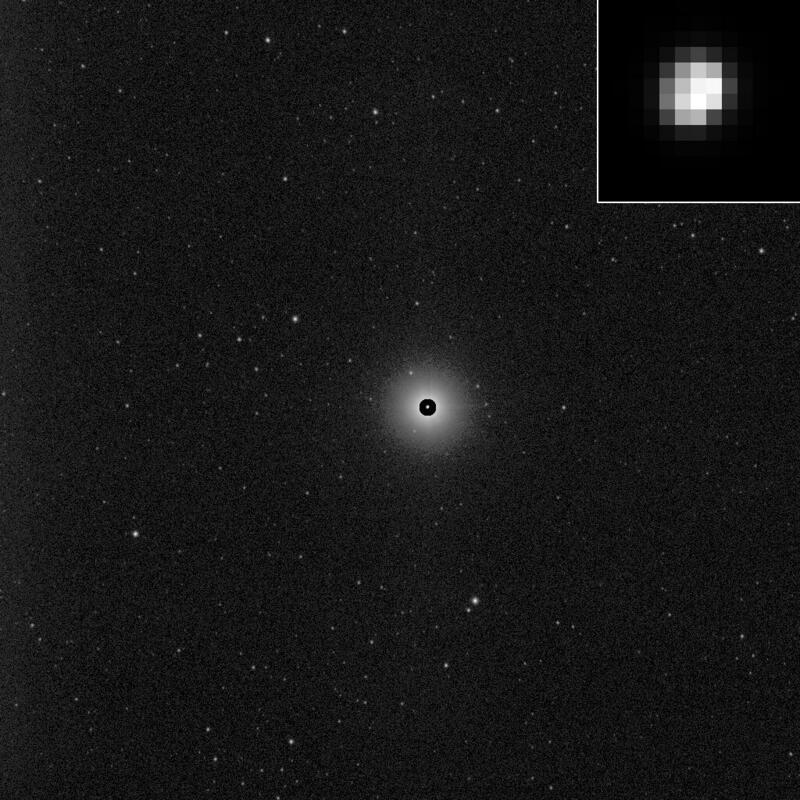 Fuzzy images from the Hubble Space Telescope (HST) taken in 1996 seemed to show that something had taken a big bite out of the asteroid's south polar region1. The crater was posited as the source of Vesta-like fragments that populate the asteroid belt, and of a surprisingly large fraction of the meteorites found on Earth. But seconds after viewing the first image, Peter Thomas of Cornell University in Ithaca, New York, shot off an e-mail to other members of the team: "Looks like HST results were fantasy!" Thomas later realized he had misjudged Dawn's location when he sent that e-mail, but his words give an idea of scientists' surprise. Vesta's huge depression isn't like those of most impact craters: it is ringed by a wall for only about half its circumference, says Dawn team member Paul Schenk of the Lunar and Planetary Institute in Houston, Texas. It also has a large rounded mound in its middle, rather than the usual conical uplift. Perhaps strangest of all is a series of troughs ringing the asteroid's equator, a feature not seen in any other body in the Solar System and which may be related to the impact and its huge scale. If it was caused by an impact, the crater is shaping up to be one of the biggest puzzles of the mission, says Chris Russell, principal investigator of the Dawn mission at the University of California, Los Angeles. Russell has commissioned a task force of scientists on the Dawn team to solve the puzzle in time for two conferences in October. New, sharper, images and spectra will help, as will maps of the asteroid's gravity. Dawn is now orbiting Vesta at a distance of about 2,700 kilometres, some six times closer than when the initial observations were made last month. The task force will use the data gathered from this closer approach to hunt for evidence of whether the hole really was caused by some sort of collision. Tell-tale signs would include rock that has melted and resolidified on the floor of the depression, and a mixture of broken rock and melted material splashed out of the hole by the force of the blow. Researchers have already come up with several possible explanations for the hole's strange shape. These all assume that the roughly 460-kilometre-wide crater was gouged out by a piece of space debris measuring 40-80 kilometres across. One idea is that Vesta, which, at 530 kilometres across is the second-largest asteroid in the Solar System, was struck not at its south pole but midway between the pole and the equator. Because it spins rapidly, completing a full rotation in about five hours, Vesta would have reoriented itself so that the gouged-out region became the rock's new south pole. This would be the most stable configuration for the damaged asteroid, says Schenk. "I don't think we've ever seen before a body with such a large impact and such a high rotation rate," he says. In January, Martin Jutzi of the University of Bern in Switzerland and Erik Asphaug of the University of California, Santa Cruz, modelled the impact that walloped Vesta and obtained some surprising results2. They calculate that Vesta completed an entire revolution while the crater was forming. As a result, the debris thrown up by the impact did not settle evenly around the crater, but fell in uneven clumps. This lopsided excavation might explain why a wall runs around only half of the impact site. The cause of the equatorial troughs remain a mystery, says Asphaug, but they might be the result of material rushing back into the hole created by the impact. "We really don't know the physics when the crater gets to be about the size of the body [it strikes]," he says. Russell is also hoping that Dawn will explain why Vesta is the brightest member of the asteroid belt, reflecting some 40% of the sunlight that hits it. Images from the craft have already showed that some regions of the asteroid are brighter than average, and revealed dark streaks on the inside of craters. Compositional information recorded by Dawn's spectrometers may also show whether the bright regions are made from different material or whether they simply have a more crystalline structure, which scatters more light, Russell says. NASA’s Dawn spacecraft obtained [url=http://dawn.jpl.nasa.gov/multimedia/dawn_vesta_image_365903669.asp]this image[/url] with its framing camera Aug. 6, 2011. The framing camera has a resolution of about 260 meters per pixel. Well, clocks melt on Vesta, thanks to the energy released by the frequent meteor impacts. Vesta, n. Note the lush urban landscape, blue skies and white clouds of V. Contrary to some reports, there are no dead olive trees on V.
New views of the second most massive object in the asteroid belt. images taken by the framing camera aboard NASA's Dawn spacecraft. The data obtained by Dawn's framing camera, used to produce the visualizations, will help scientists determine the processes that formed Vesta's striking features. It will also help Dawn mission fans all over the world visualize this mysterious world, which is the second most massive object in the main asteroid belt. 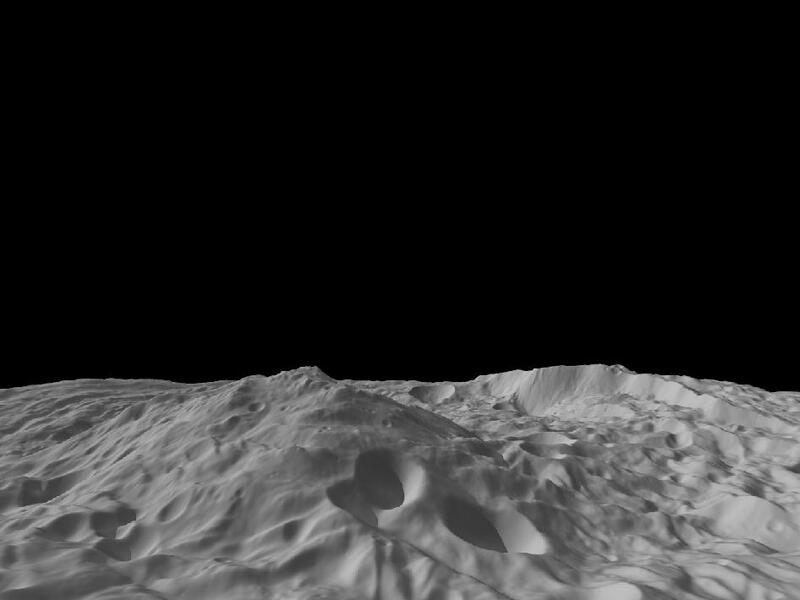 The video shows Vesta as seen from Dawn's perspective. You'll notice in the video that Vesta is not entirely lit up. There is no light in the high northern latitudes because, like Earth, Vesta has seasons. Currently it is northern winter on Vesta, and the northern polar region is in perpetual darkness. When we view Vesta's rotation from above the south pole, half is in darkness simply because half of Vesta is in daylight and half is in the darkness of night . 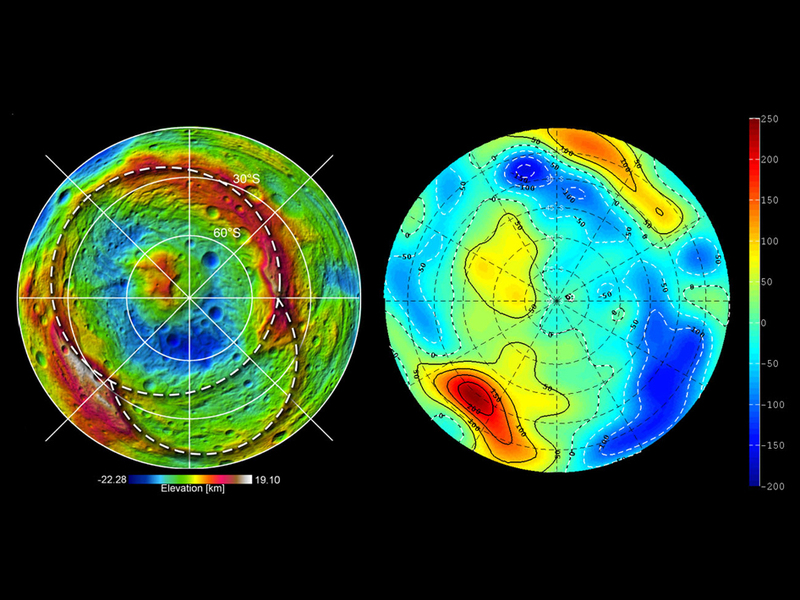 Another distinct feature seen in the video is a massive circular structure in the south pole region. Scientists were particularly eager to see this area close-up, since NASA's Hubble Space Telescope first detected it years ago. The circular structure, or depression, is several hundreds of miles, or kilometers, wide, with cliffs that are also several miles high. One impressive mountain in the center of the depression rises approximately 9 miles (15 kilometers) above the base of this depression, making it one of the highest elevations on all known bodies with solid surfaces in the solar system. The collection of images, obtained when Dawn was about 1,700 miles (2,700 kilometers) above Vesta's surface, was used to determine its rotational axis and a system of latitude and longitude coordinates. One of the first tasks tackled by the Dawn science team was to determine the precise orientation of Vesta's rotation axis relative to the celestial sphere. The zero-longitude, or prime meridian, of Vesta was defined by the science team using a tiny crater about 1,640 feet (500 meters) in diameter, which they named "Claudia," after a Roman woman during the second century B.C. Dawn's craters will be named after the vestal virgins-the priestesses of the goddess Vesta, and famous Roman women, while other features will be named for festivals and towns of that era. Take a Spin Around Asteroid Vesta! Scientists leading’s NASA’s Dawn mission have discovered a 2nd giant impact basin at the south pole of the giant asteroid Vesta, which has been unveiled as a surprisingly “dichotomous” and alien world. Furthermore, the cosmic collisions that produced these two basins shuddered through the interior and created vast troughs, a Dawn scientist told Universe Today. Since achieving orbit in July, Dawn’s Framing Cameras (FC) have imaged most of Vesta at about 250 meter resolution and the Visible and Infrared mapping spectrometer(VIR) at about 700 meter resolution. The measurements were collected at the survey orbit altitude of 2700 km. 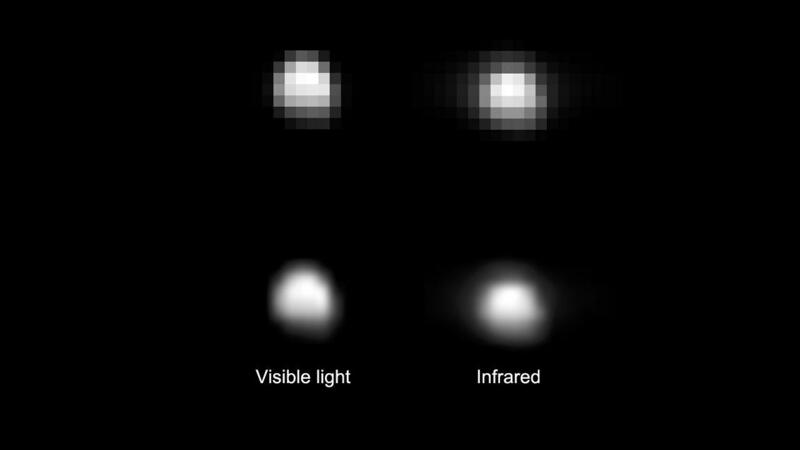 Before Dawn, Vesta was a fuzzy blob in humankind’s most powerful telescopes. PS: Dawn images of Vesta! Released!! For everyone!!! NASA's Dawn mission has received official confirmation that 40 extra days have been added to its exploration of the giant asteroid Vesta, the second most massive object in the main asteroid belt. The mission extension allows Dawn to continue its scientific observations at Vesta until Aug. 26, while still arriving at the dwarf planet Ceres at the same originally scheduled target date in February 2015. NASA's Dawn spacecraft has provided researchers with the first orbital analysis of the giant asteroid Vesta, yielding new insights into its creation and kinship with terrestrial planets and Earth's moon. Vesta thought its days of being the solar system's punching bag were over. Despite 3.5 billion years of pummelling, the protoplanet had managed to hold itself together. The bullies of the asteroid playground had mostly settled down, and aside from the occasional shove or taunt, things were starting to look up. If only poor Vesta had known of the two bullies that were still to come. Fresh images of 4.5 billion year old Vesta show the poor protoplanet was pummelled by a 60-kilometre-wide rock not once, but twice, in the past two billion years. And those strikes dug up enough material to create an entire class of meteorites. If Helen of Troy had "the face that launched a thousand ships", then Vesta has Rheasilvia and Veneneia, the craters that launched a thousand meteorites. Astronomers had suspected for decades that Vesta – the solar system's second-biggest asteroid – was the source of the howardite-eucrite-diogenite, or HED meteorites. This common group of space rocks makes up about 6 per cent of the meteorites seen to fall to Earth: the Meteoritical Bulletin Database lists 1082 that have been found on the ground. Both the asteroid and HED meteorites give off similar spectral signatures that were different from other classes of meteorites, and both looked like basaltic lava of the sort that is found in Hawaii. Vesta's orbit around the sun is also just right for sending debris to Earth. Meanwhile, observations with the Hubble Space Telescope in 1997 showed a giant crater in the South Pole. That was the "smoking gun", says Paul Schenk of the Lunar and Planetary Institute in Houston, Texas. But a few mysteries remained. Could a single hole in Vesta's South Pole really have dug up enough material to account for all HED meteorites? How deep is the hole, and how long ago did it form? And how many impacts were there? A group of smaller asteroids called Vestoids are thought to be chips of Vesta knocked off in a giant impact. But some studies of the way they move had suggested that these are divided into two distinct populations – one about a billion years older than the other. New images from NASA's Dawn spacecraft are filling in the details. Dawn slipped into orbit on 17 July, 2011 and has mapped nearly 80 per cent of the asteroid's surface. The images show that Vesta's northern hemisphere is pockmarked with craters, a record of billions of years of pummelling. "It's been hammered quite a bit," Schenk says. But whatever craters had been preserved in the southern hemisphere were obliterated by one huge impact, which Schenk and colleagues estimate came about a billion years ago. The crater this vast asteroid bully left behind, called Rheasilvia, stretches to 500 kilometres, wider than the distance from London to Dublin and spanning most of Vesta itself. It's at least 19 kilometres deep, and has a central peak that rises 20 kilometres high, higher than Mauna Kea on Hawaii. That means the object that hit Vesta must have been 50 to 60 kilometres wide, bigger than the object that made the Chicxulub impact crater thought to be responsible for killing off the dinosaurs. Debris from the crater can be found 100 kilometres away from the rim. The force of the impact formed deep grooves that circle Vesta's equator. "It's the largest possible ring you can make due to an impact," says Chris Russell of the University of California, Los Angeles. "We've never seen anything like that before." The team calculated that the impact scooped a million cubic kilometres worth of material out of Vesta's South Pole, and scattered much of it into space. The HED meteorites plus the Vestoids have a total estimated volume of 100,000 cubic kilometres, so the Rheasilvia impact alone could have been responsible for the lot. But beneath all the destruction the researchers also found a second impact crater, Veneneia, almost as large as Rheasilvia but half-hidden underneath it. About 400 kilometres wide and 12 kilometres deep, it formed about two billion years ago, Schenk and colleagues determined. "That was a surprise, that in fact the southern part of Vesta had been subject to two very large impacts," Russell says. Vesta probably would have been destroyed by the one-two punch, if not for a characteristic that makes it seem more planet than asteroid: an iron core. In its first million years of existence, Vesta was completely molten, Russell says, and the heavier elements like iron sank to its centre to congeal into a solid metallic core. "It was anchored by that iron core, and survived," he says. "And fortunately so, because we don't have many ways of getting back that far in history, to get some evidence of what was going on in those very early days." There's another silver lining to Vesta's tortured playground years: HED meteorites are so numerous, you could own one. "You can go to a meteorite collection store, and they'll sell you a piece of Vesta," says Russell. A new video from NASA's Dawn mission reveals the dappled, variegated surface of the giant asteroid Vesta. The animation drapes high-resolution false color images over a 3-D model of the Vesta terrain constructed from Dawn's observations. This visualization enables a detailed view of the variation in the material properties of Vesta in the context of its topography. The colors were chosen to highlight differences in surface composition that are too subtle for the human eye to see. Scientists are still analyzing what some of the colors mean for the composition of the surface. But it is clear that the orange material thrown out from some impact craters is different from the surrounding surface material. Green shows the relative abundance of iron. Parts of the huge impact basin known as Rheasilvia in Vesta's southern hemisphere, for instance, have areas with less iron than nearby areas. 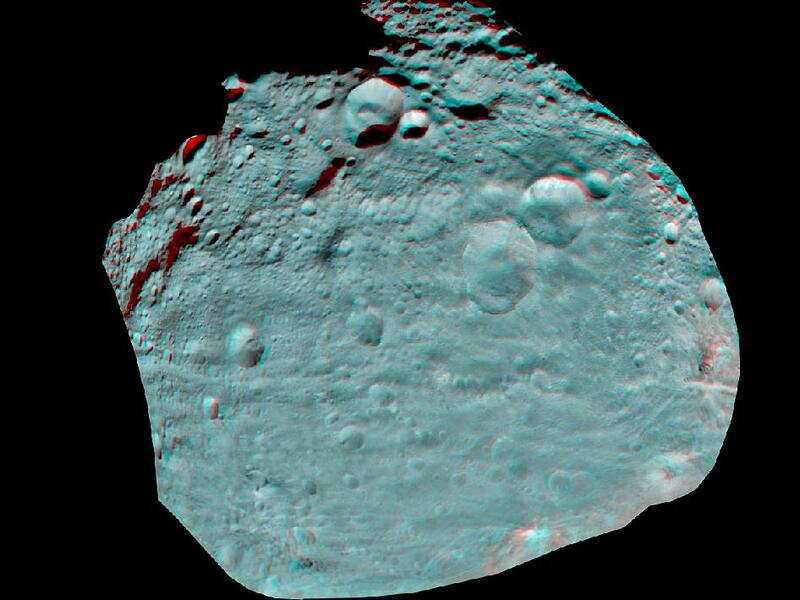 Dawn has imaged the majority of the surface of Vesta with the framing camera to provide this 3-D map. While some areas in the north were in shadow at the time the images were obtained by the camera, Dawn expects to improve its coverage of Vesta's northern hemisphere with additional observations. Dawn's viewing geometry also prevented mapping of a portion of the mountain of the south pole. If this asteroid will go nearer to our planet, this could be dangerous to as humans.. Engineers working on NASA's Dawn spacecraft are assessing the status of a reaction wheel -- part of a system that helps the spacecraft point precisely -- after onboard software powered it off on Aug. 8. Dawn's mission is to study the geology and geochemistry of the giant asteroid Vesta and dwarf planet Ceres, the two most massive objects in the main asteroid belt. Dawn is now using its thrusters to point at Earth for communications. The rest of the spacecraft is otherwise healthy. The spacecraft has been orbiting Vesta since July 15, 2011. Dawn concluded its primary science observations of Vesta on July 25, 2012, and has been spiraling slowly away from the giant asteroid using its ion propulsion system. Ion thrusting was halted to accommodate the reaction wheel investigation, which may briefly delay the escape from Vesta. "The Vesta mission has been spectacularly successful, and we are looking forward to the exciting Ceres mission ahead of us," said Robert Mase, Dawn project manager, of NASA's Jet Propulsion Laboratory, Pasadena, Calif.
NASA's Dawn spacecraft is on track to become the first probe to orbit and study two distant solar system destinations, to help scientists answer questions about the formation of our solar system. The spacecraft is scheduled to leave the giant asteroid Vesta on Sept. 4 PDT (Sept. 5 EDT) to start its two-and-a-half-year journey to the dwarf planet Ceres. Dawn began its 3-billion-mile (5-billion kilometer) odyssey to explore the two most massive objects in the main asteroid belt in 2007. Dawn arrived at Vesta in July 2011 and will reach Ceres in early 2015. Dawn's targets represent two icons of the asteroid belt that have been witness to much of our solar system's history. To make its escape from Vesta, the spacecraft will spiral away as gently as it arrived, using a special, hyper-efficient system called ion propulsion. Dawn's ion propulsion system uses electricity to ionize xenon to generate thrust. The 12-inch-wide ion thrusters provide less power than conventional engines, but can maintain thrust for months at a time. "Thrust is engaged, and we are now climbing away from Vesta atop a blue-green pillar of xenon ions," said Marc Rayman, Dawn's chief engineer and mission director, at NASA's Jet Propulsion Laboratory, Pasadena, Calif. "We are feeling somewhat wistful about concluding a fantastically productive and exciting exploration of Vesta, but now have our sights set on dwarf planet Ceres. Dawn's orbit provided close-up views of Vesta, revealing unprecedented detail about the giant asteroid. The mission revealed that Vesta completely melted in the past, forming a layered body with an iron core. The spacecraft also revealed the scarring from titanic collisions Vesta suffered in its southern hemisphere, surviving not one but two colossal impacts in the last two billion years. 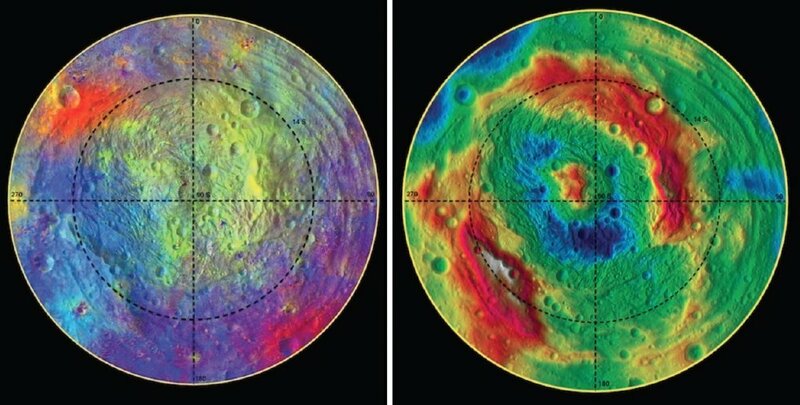 Without Dawn, scientists would not have known about the dramatic troughs sculpted around Vesta, which are ripples from the two south polar impacts. "We went to Vesta to fill in the blanks of our knowledge about the early history of our solar system," said Christopher Russell, Dawn's principal investigator, based at the University of California Los Angeles (UCLA). "Dawn has filled in those pages, and more, revealing to us how special Vesta is as a survivor from the earliest days of the solar system. We can now say with certainty that Vesta resembles a small planet more closely than a typical asteroid."